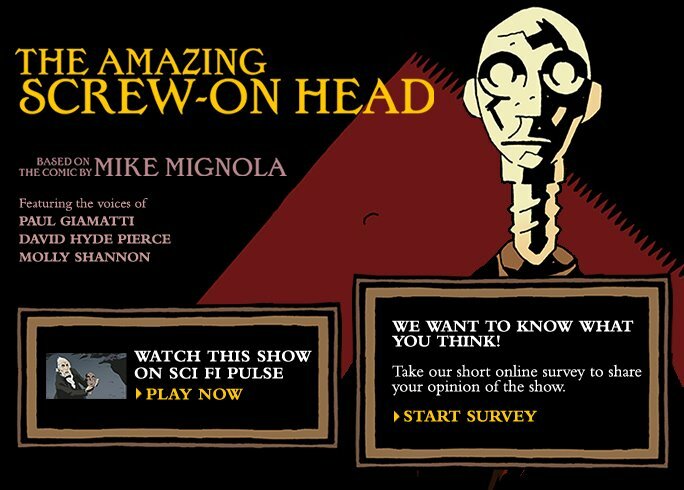 This has been out for a few weeks know, but if you haven't already checked it out, the amazing Amazing Screw-On Head pilot is available to download from the Sci-Fi channel here. From it's amazing visuals and amazingly irreverent story by Mike Mignola (Hellboy) to the well-known actors who lended their talents (the amazing Paul Giamatti, David Hyde Pierce, and Molly Shannon, among others), viewers will be blown away by its amazingosity. The animated pilot follows the adventures of Amazing Screw-On Head, dead but trapped in a robot head -- Isn't that just amazing! Amazingly, he serves as a secret agent to President Abraham "Amazo" Lincoln and fights dastardly deeds by netherworldly villains. And it's got zombies -- amazing! Once you've seen it, be sure to fill out the survey. Apparently, Sci-Fi is not sure about producing more episodes (which we doubt, this is probably publicity stunt- shhh), which would be amazingly stupid since it's so amazingly good. Isn't that just amazing?